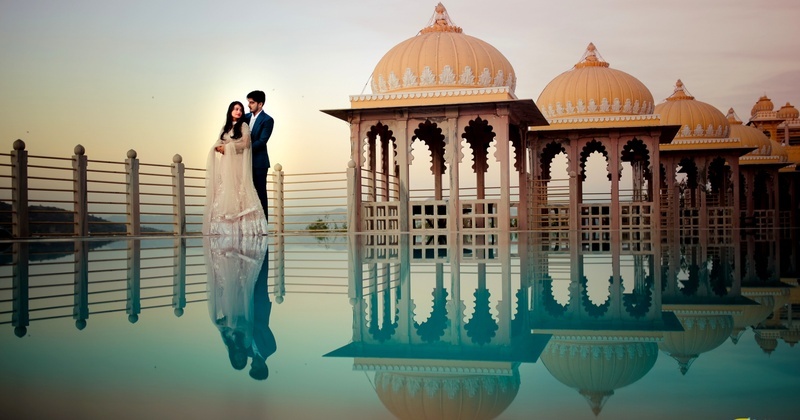 This Udaipur Pre-wedding will give you some major fairytale feels! In Udaipur, a city of breathtaking palaces and colorful streets, Rahul and Suman decided to do their pre-wedding shoot and let me tell you beforehand, the pictures are breathtaking! For the first look, Suman chose to wear an all-white lehenga choli with a very prominent pink and white border on it! I am in love with how she draped the dupatta the traditional rajasthani way. Also, totally stunned by how Movie’ing moments has captured this shot, giving it a very old-world vibe to it! For the second look Suman is spotted wearing a light dusty pink lehenga-choli with silver embellishments on it. Loving how Movie’ing Moments photography has captured these shots so brilliantly! Suman’s third look is again something that I totally adore! She’s opted to wear a blue lehenga-choli consisting of a high-waist lehenga skirt and choli with dramatic tassels on it towards the end! What’s caught my attention though is the sheer dupatta with dainty motifs on it, giving me major Chand chupa badal me feels! Don’t you think? Also, totally digging Rahul’s dhoti pants! Aren’t you in love with this couple’s unique pre-wedding shoot too? Because I totally am bowled with it! Location - Hotel Chunda palace, Udaipur. Photographer - Movie’ing Moments .